I spent 10 years in higher education, with eight of those years at The Ohio Dominican University in Columbus, Ohio. One of the great benefits of being a professor is seeing your students graduate and start developing wonderful careers. Today, I’m excited to be joined by one of my former students, Ashley Matthews, Senior Tax Manager at Rea & Associates. A constant struggle in public accounting is that work is always being added, but never subtracted – and this issue was exacerbated by the economic downturn in 2008. Public accounting practices became leaner and hiring slowed down to a crawl. The result is a gap in experienced senior managers, because there were so few new hires 5-8 years ago. CPAs rising in the industry need to be adaptable and maintain an open line of communication with the people they work for, in addition to their clients. People who are not in public accounting, and clients, may not think of the word adaptability and CPA in the same sentence, but CPAs must be adaptable to everyday occurrences in order to be successful. If you’re not adapting, you may be way too rigid and start losing clients and business. CPAs like Ashley, who are often Millennials, are fighting the stereotype of an awkward business person chained to a desk counting beans. At Rea & Associates, they want clients to view them as trusted business advisors who understand all aspects of the clients’ businesses so that they can help the clients improve their businesses. Ashley and her associates are trying to break the CPA mold not only in the eyes of the outside world, but also in the eyes of their clients. I really enjoyed talking to my former student Ashley, and she offered an enlightening glimpse into the minds of a hungry generation of young professionals who are currently working their way up the ladder, in every industry. I expect we’ll be learning more about communication, technology and business relationships from Partner Ashley Matthews in no time at all. Peter: Hey, welcome back to Improv Is No Joke. Many of you know that I spent 10 years in higher education, with eight of those years at THE Ohio Dominican University here in Columbus, Ohio. One of the great benefits of being a professor is you get to see your students graduate and go off and start developing wonderful careers. I’m excited today to have one of my former students, Ashley Matthews, joining me today on the podcast. Thank you, Ashley, for taking time out of your busy schedule to be interviewed. I greatly appreciate it. Ashley: Of course, I’m happy to be here. Peter: And I have to say I am so proud to see how your career has evolved from the days that you left Ohio Dominican to where you are today. You, Rachel, Bryce – just to name a few – I love it when I get together and talk with you guys because it’s so different than talking to you back in 2004. Ashley: Well, I hope so. I hope we’ve grown a little bit since then, but those are very kind words. Thank you. Peter: Well Rachel, you have grown. Bryce? The jury’s still out. Ashley: Yeah, still a work in progress. Peter: So before we begin what I’d like you do is, so the audience can get to know you just a little bit better, give us your background starting with when you graduated from THE Ohio Dominican University. Ashley: Sure. I graduated in 2007 with my bachelor’s. I went on to take a couple courses after graduation, to be eligible for the CPA exam. A lot of my peers went on to get their master’s degree. I did not. I just took those extra courses and did an internship with Deloitte in 2006, prior to graduation. I joined them full-time in January 2008. I was with Deloitte for almost eight years and left this past fall to join Rea & Associates. Most of my background and work is in taxation – so, fun stuff. Peter: So what kind of stuff do you work on? Peter: You said fun and tax – okay hold. Peter: Just so the audience knows, we’re on a skype video call and she’s got this wonderful smile while she’s sitting there describing her background and tax, so I know she really loves what she does. Ashley: I do. I do love what I do, and you know leaving the industry was never an option for me. I knew I want to stay in public accounting, and I love the work that I did, and I’m glad that I found a firm that fit well with with what I wanted to do and supported that. Peter: Why did you leave Deloitte for Rea? Ashley: You know, I was looking for more transparency in my upward mobility and kind of a guarantee that if I work hard it’s gonna pay off, and Deloitte is such a large firm and you never really know what’s going to happen no matter how hard you work. I was looking for a little bit more transparency there and I’m always looking for the work-life balance. It wasn’t quite where I wanted it to be a Deloitte, and so joining Rea provided the balance I was looking for. Peter: Work-life balance. Now remind me, how many children do you have? Ashley: I have three children. Ashley: Exactly, exactly. So flexibility was huge for me, which I did find at Deloitte but I just needed a little bit more. Peter: And you have been able to get that at Rea & Associates, and you’ve been with Rey for less than a year, is that correct? Ashley: Correct, yes, and I have been able to find that and the professionals that I’m working with here are wonderful, so it’s been a great change for me. Peter: And what is your current title at Rey? Ashley: I’m a manager. I focus on tax services but do a little bit of everything now, with the client base that I have. Peter: So how often are you out at your clients? Ashley: I try to get out there often. You know, as often as I can – I don’t like to be behind my desk. It depends on the time of year, the season, and now we’re kind of in consulting mode, so we’re out of that compliance piece, chained to our desks, and trying to to figure out the other ways that we can can provide value and help our clients. So trying to get out there as much as I can. Peter: So what’s your biggest challenge in dealing with your clients? From being, as you said, chained to your desk to then actually having to be face-to-face in front of them. Ashley: So the biggest challenge is communication. Everybody communicates differently, and and you have clients who have expectations of return phone calls and emails, and how do we exchange that dialogue in person? Really figuring out their preferred method of communication and figuring out how to deliver those messages in the way that they appreciate receiving them. It’s a challenge, and especially for me with a whole new client base – some of them are legacy Rey clients, a few of them we picked up since I joined the firm, and so navigating those relationships that already exist with Rey and the ones that are new to the firm is a challenge. Ashley: Yeah, exactly. The transition is hard. Sometimes it’s a retiring partner and they don’t understand or don’t want to see them go, but yeah I think, just like any public accounting firm, Rey experiences turnover and these clients are great, they hung in there – and Rey’s obviously doing something right for client service team to turn over multiple times – but for the most part they get disillusioned with the whole process of meeting a new person then getting them onboard, and really they may be happy with the status quo so when somebody new comes in and tries to switch it up there’s a little bit of pushback. Peter: So how do you put your client at ease? I can imagine it’s a huge challenge, especially if you pick up a client from a retiring partner who’s been with them for a number of years and then you’re the new contact person. Over time, how do you put that client at ease? Ashley: You know, for me it’s the do. Lots of people can say lots of great things and wow them with technical knowledge or experience or their personality, but for me the money – and I say money in terms of where they really find that they’ll follow you – is really in the do. So are you of your word? 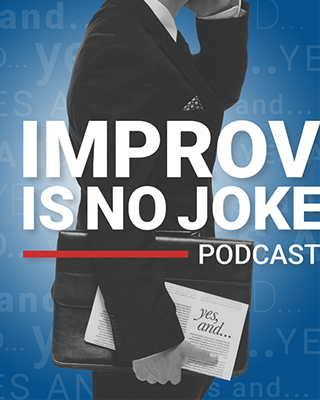 Do you get stuff done timely? Do you exceed expectations? Setting yourself up to exceed expectations vs. meet them is huge. If I know I’m going to get your project done in a week I’m going to tell you maybe a week and a half, maybe two weeks, because I want to exceed your expectations and I want to set a client up for exceeding their expectations. If I’m always just meeting expectations then I’m mediocre. So we want to make sure you know that we’re managing their personalities, which is great because partners can pass down that knowledge, but at the same time I want to re-evaluate how we’re doing things. Are we doing them the most efficient way possible? Are we bringing all the value to the client that we could be bringing? Are there things that we haven’t thought of in the past that we should be thinking of now? Bringing those up in conversation and proposing those types of changes are great, but implementing them is another story and I feel like my credibility comes from my ability to execute. 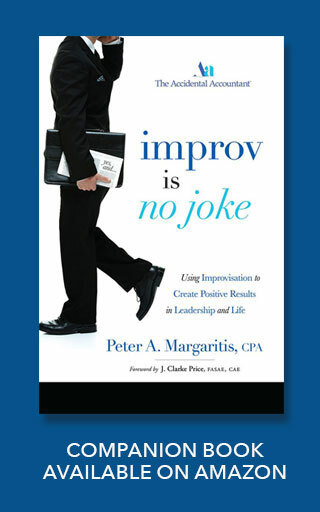 Peter: When you were talking about exceeding expectations vs. meeting expectations, because, for a lot of people, if they can get it done in a week they will say, I’ll have it to you in a week – but as you well know, in public accounting, every day’s a fire drill. Ashley: Exactly. I have a to-do list a mile long and there are days I come in and nothing on that to-do list gets done. It’s always something different and more important and yeah – I mean fire drills come up all the time, and so realistically, yes, if I could sit down and focus on that project I would get it done in a week. It’s not a perfect world, and so two weeks is probably more realistic, but I will love to get it to you in a week. Peter: Yeah, but I like the fact that you – because if I could sit down and completely focus, which is very difficult during a fire drill that’s going on and something is always more important, and then you’re at that a week later and it’s harder to call the client say, “look I need a few more days,” versus I’m gonna build a buffer in this project so that, when things do come up, it’s not gonna set me behind and I’m still going to meet the expectations and still make that client feel good about me having met those expectations. Ashley: Yeah, and a lot of times we’re dealing with time-sensitive information. A lot of times clients are looking for us to give them information so that they can make business decisions, and so you know if they need a quick turnaround we can do it. I pride myself in getting clients timely information and really working closely with them in that regard, and so I don’t wanna make it sound like I’m gonna say, “Oh, sorry, can’t do it. I need more time.” We’ll get it done, but when you’re looking at those things that may not be quite as time sensitive, or if it’s a large project you want to build in time so that you make sure that you can meet and/or exceed their expectations. Peter: So in this conversation of communication I’m hearing a couple things: one, the communication with the client and also coming back into the office and the communication with the partner that you report to. They’re going, you know what we’ve got a time sensitive thing that we’ve got to get done. What can you take off of my plate so I can get this thing done? Ashley: Adding to and never subtracting. So I think it’s a big issue in public accounting right now. After the downturn in 2008, we worked with leaner practices than we would prefer: we hired less and we still had attrition when the economy turned around a little bit, and so at that 5-8 year mark, you know, experienced manager – senior manager – there’s a lot of gaps. There’s a lot of work and not many people for it to go around to, and so we’re doing more with less people and those conversations happen frequently and they’re difficult. I found that you have to be stern and you have to mean what you say in order to be taken seriously. People have a tendency to pile on and see how much you’ll take, and so pushing back is always appropriate but that open line of communication with who you work for, and prioritizing your work and maybe calling another client who has a project that’s maybe not quite as time-sensitive and saying, “hey, it looks like we may need some more time,” or just explaining. A lot of clients are going to understand, and so it’s very helpful to have somebody to talk to about that and and really to support you. Peter: Yeah, having spent some time in public I thoroughly agree and I think those who are not in public accounting, and clients, don’t really think of the word adaptability and CPA in the same sentence, but as you very well described CPAs must be adaptable to everyday occurrences in order to be successful, because if you’re not adapting its way too rigid and we’ll start losing clients and losing business. Ashley: Yeah, this definitely is not a profession for someone who wants to come in and sit at their desk and have their day planned out and be predictable and get their to-do list done every day and punch the clock and go home. For sure, it’s not. Peter: But that’s the stereotype that’s out there, so how are you breaking the stereotype? Because we have we have to start breaking it. Ashley: Oh my gosh, yes. I tell people I’m a CPA and you get the weird kind of look like, huh? Really? So I think, like you said, the CPA stereotype is just of a person that’s chained to a desk every day cranking out financial statements or tax returns or counting beans in the back office, right? That’s the famous stereotype there. We’re working, especially here at Rey, for our clients to view us as their business advisor – their trusted business advisor. We want to understand all aspects of their business, not just their tax compliance issues or their issues with GAAP and their financial statements. We want to understand how they operate. We want to help them improve their processes, and, to us, in order to be successful in the space, that’s something that we we have to do. Not only are we trying to break the mold, as far as perception of accounting goes for people in the outside world, but for our clients as well. Peter: Yeah, and you’re doing the right things by getting out from behind your desk, getting to know the client, getting to know how the operations work. Not just not focusing solely on the tax piece or the auditing piece. I’ve got a number of stories where CPAs haven’t visited a client in years, and we’re not talking individual clients we’re talking business clients. Information comes in, we take care of something, we send it back, and there’s really no relationship-building there. To become that trusted business advisor, you have to get out. You have to build a relationship with your client. They need to get to know you and you need to get to know them and their business, and it sounds like Rey is doing a great job with that, in order to help the firm continue to grow. Ashley: Yeah, I mean that the future of the CPA and public accounting is not more complex regulatory issues, it’s not more gap pronouncements, it’s not more complicated code sections and regulations. It’s really in how do we increase profitability for our clients, how do we help them navigate the business issues that they’re having, how do we become that partner? Peter: To be viewed as a part of doing business or an investment in our business, versus a the cost of doing business. Ashley: We don’t want to be a sunk cost, that’s for sure. Peter: That’s right, and it sounds like you’re going down a great path. So, you graduated in 2007 and you’ve been out in the workforce – you are that 5 to 8 to 9 year person that has this void, and you’re classified as a millennial, which works differently than my group, the baby boomers. How has that been in your career, in navigating those waters? Ashley: So that’s a hard thing to manage with the new generation coming in, because we are not afraid to put our head down and work and to do that that hard work and put our time in, but we want to see the impact we’re making and we want to understand how what we’re doing benefits and contributes and really how we’re appreciated. It’s just generational norms. Its differences there, and most companies who are successful in managing the generation and bringing on Millennials understand that there’s a difference in the thinking of where we work and what we do in careers and how that impacts our life, and they’re willing to accept that and really help us flourish. Peter: Or I saw last year on CNBC that Millennials contribute over 2 trillion dollars in US consumer spending. Peter: Yeah, so what’s in that stereotype of that millennial is they’re not coming out of college, they’re in the workforce. You guys may work differently than the way we did growing up, but you’re much more technologically savvy. When I left Ohio Dominican and was out I said, and I would say this even when I was at ODU, I would love to be a senior graduating at that point in time, because I always said you guys always had the world by the tail because of your drive, your determination, and your technological savvy. You guys will go out there and break that stereotype and say, you know, I don’t have to be chained to a desk. Give me the work, let’s use the technology, lets get it done. Public accounting is a profession, however we do punch a clock just like somebody walking into a distribution center, so I think that’s a little bit of the “have you punched that clock today, have you looked at that, I haven’t seen you sitting here,” but you know what? You’re providing excellent value to the firm and to the client when you’re able to work in a different way. Ashley: Right, and, especially in public accounting, it’s trending up upward in terms of firms adopting this perspective, but a lot of it now is I don’t care where you work as long as your clients are happy and the work is getting done, and that’s huge – especially for my generation. People in the early part of the generation are having families and have children, and those in the later part of the generation have other responsibilities and things that they want to do too, and commuting to an office everyday may not be something that they want or are willing to do, and if it helps with their job satisfaction to be able to utilize technology in a manner that they can do their job and do it well from somewhere other than a desk, in an office, then I think that companies are wise to embrace that. Peter: But the partner said, “Okay, how would you do this?” And he goes, you’ve got ten partners in this office. Why don’t we have 20 partners in this office? Spread out the work so we’re not working long hours, spread out that wealth and you’ve happier people. He said that that really resonated with that partner – this was about two years ago – and they’re going through a process of changing that culture, changing that firm structure. So my question to you would be, if Rey was your firm, or you want to have your own firm, what would you do different today that maybe other firms aren’t doing differently, or even as in Deloitte? Ashley: –and were behind their desk. I’m sure you, maybe, are familiar with that a little bit. Ashley: [laughs] But their perspective on how you climb the ladder is different and I think about succession planning a lot, because I want to be a partner in our firm but I want to be a partner in a firm that I’m proud of and a firm that is willing to grow and change and meet the needs of the professionals that will be running it eventually, and so for me technology is huge and changing the way that we do the work that we do. Evaluating efficiencies and processes and morale and the work that we’re doing constantly – the profitability of our clients, do they make sense to us, and not keeping certain clients that may be better and happier served by another firm just because that relationship is there and it’s been there for years. Really evaluating where do we make money, what makes our people happy, where do we want to be, and not just taking on all clients that we can take on because we can, and being thoughtful about where we where we put our resources and spend our time. And being more transparent about where we see people in the firm, where we see their career going, where they are in the pipeline, so to speak. That’s huge, as far as partner track goes. Do we see you becoming a partner? How have we slotted you in our partner pipeline and our succession planning? Just being transparent of that. You know, if somebody’s already counted me out before I’ve even been able to to make a difference I want to know that, because that’s something I have to work against. For me, its technology, its transparency, it’s being smart about the work that we’re doing and when we’re doing it, and it’s realizing that the best decisions and some of the best relationships are made when you’re out from behind your desk and really talking to people. Peter: I thoroughly agree, and you mentioned something about resources and investing. How does that relate to your continuing education, because obviously we know we have a compliance that we have to meet X amount of hours, but how does that fit in? Ashley: So I think there there’s obviously a difference in size of firm and internally developed versus externally developed and whether we’re making a commitment to educating our people or a commitment to making sure they’re in compliance with their licensing requirements, and so you know I was happy that – coming from Deloitte, which has internally developed continuing professional education that was top-notch and it was great and they built a university for it – but coming to Rey the first thing that I was told was, “Hey, probably the Ohio Society and AICPA courses are not going to cut it for you in terms of technical skills, and there’s going to be some but not all. So really focusing on and looking for where am I going to get the most value, where is the most relevant information for me, and how how am I going to learn what I need and stay on top of changing regulations and learning even those soft skills and improving those – not just taking the one-hour free course just because I need the CPE credit. Peter: Right. We need you to be well rounded. First and foremost, technically sound, when you sit in front of the client, but the ability to communicate with that client in a manner that connects with them and that they understand – because we speak a different language in accounting. Peter: It’s just like speaking Japanese to somebody, or Greek. Peter: Because, when you say depreciation to someone who’s not an accountant, they go, oh that’s the value I lose my car when I drive it off the car lot. Peter: And you’re going no, no no. That’s a systematic allocation of an asset over time, and they’re going what is that? Peter: So it’s bridging that bridging that gap and being able to connect with that client in a way that you are that trusted business advisor. Ashley: Yeah, and you know I would connect that back to working with the boomer generation. I don’t want people to think that, as Millennials, we’re just biding our time to get your job. Ashley: There’s so much that I can learn from those partners, and there’s so many things that they do great, and I don’t want to change everything – but I think there may be a way that we can do it better. But their ability to build relationships, their ability to communicate technical things to their clients and to really have those difficult conversations, and how they operate and navigate that world. There’s a wealth of information for us to learn and bring me along – I want to see it. I want to see how you interact and and, for me, I learn the best there. Peter: Yeah, that’s a great training ground – being out there with the partner and the client and watching how they’re interacting, as well as being prepared for when the partner looks at you and says, so you want to explain this, or if the client doesn’t look at the partner and says, I’m gonna ask you this question, that you’re able to sit there and think about it for about a split second and provide them with a coherent, intelligent answer. Ashley: Yep, and the expectation is, when you’re in front of a client, that you have some type of an answer – and I’ll get back to you works a lot, but, when you’re face-to-face with somebody, “I’ll get back to you” doesn’t always work. But some of the skills that I’ve learned, in terms of having conversations with clients that may be difficult, like billing conversations where we can’t quite get to the answer they want or we’re communicating an adverse tax effect. I’ve learned how to have those conversations from being in a partner’s office when he calls the client or tagging along with a partner when he has those conversations, and how he or she handles them have really shaped how I’m able to to have those conversations as well. Peter: We have to have difficult conversations with our clients, but you’re now in a manager role and you have to be able to have that same type of conversation with that client and with the people that report to you, and I have found that sometimes having that conversation with people that report you is a lot harder than having it with the client. Ashley: As I try to pass those skills down the to the people that report to me, my staff and seniors, I find that their tendency is that, if we’re communicating adverse results, they internalize it as being something they did wrong and that’s not the case. Delivering bad news is hard enough as it is without having the attitude that you somehow did something wrong, and so trying to counsel that out of people is very hard. Peter: It is really hard, but it’s also a learning process. I think, because the person’s thinking oh my god I just made a mistake, I did something wrong, versus the viewpoint of maybe I did make the mistake, but what should have been? How can I learn from this so I don’t make that same mistake again? Mistakes are just learning opportunities. Ashley: They are. They definitely are, and I think those learning opportunities are further reinforced by how I respond to that mistake. They have already beat themself up enough that they made a mistake, especially the millennial generation because we want to be right and we want to do it right and we want to learn how to do it right, and so, for me, saying anything negative or in a negative tone or anything is not going to help the situation at all, and so my job as a leader is to figure out and bring them back up and. How do we come up with a solution and how do you learn from this so it doesn’t happen again? Peter: It sounds like a lot of empathy from what I’m hearing. I had a boss at Victoria’s Secret who once told me don’t come into my office with your problems, come into my office with a problem and your solution, whether it’s right wrong or indifferent, but don’t ever walk into my office without a solution – and I learned that the hard way, but that’s something that I pass down all the time. We’re going to make mistakes, and I love how you empathize and you’re not using a negative tone. I’m hopeful that you’ve come in here with how you can solve it, and if not then, as my former boss did – she sent me away with an hour to come up with a solution or two. Were they right? No, but it led us down a path to finding a solution. Ashley: Right, and that helps them grow. I mean, in this profession especially, you learn by doing and if your boss always gave you an answer then you’re going to come for an answer and you’re not going to think about it, and I find that train of thinking has to be learned because the first thought is “this is wrong” and it’s never “okay, well what’s the impact and how does how does it impact X and if we fix it this way what does that mean for fix it that way what does that mean?” People hate the term materiality, but is it material? Just think it through, take it through that one more step, because wrong answers sometimes have different levels of wrongness. Peter: [laughs] Different levels of wrongness. Some are okay wrong, and some are oh crap wrong. Ashley: [laughs] Well, I guess if we’re talking about a $600 mistaking versus a number much larger than that – now that’s relative to the size of the client, but I think having some perspective in that regard helps a little bit. Peter: Yeah, very well put. Anything else you’d like to add before we begin to wrap this up that we maybe haven’t discussed? Ashley: I think, as far as you know looking at Millennials and as they’re growing to become leaders, we’re not okay with sitting on our hands and waiting. We’re knocking on that door and we want to be the next partner, the next leadership team, in our firm and and in our workplace, and we want to be difference-makers and make a change. If you’re expecting somebody that’s gonna sit behind the desk and and do everything you asked – you’re not going to find that in my generation. Peter: Very well put, and I love the fact youlike to get out there, you like to get your hands dirty, you want to in front of the client, you want to be involved within the firm from the get-go. The likelihood that you would leave drops dramatically the more that you are emotionally invested into the firm, and to get emotionally invested into that firm requires a lot of conversation and a lot of trust, and a lot of those things that on both sides in order to feel that emotional equity, per se. Peter: Before we wrap this up, just so the audience can maybe get to know you a little bit better, I’m gonna put you through my 10 quick questions. It’s a rapid-fire kind of thing, so are you ready for this? Peter: [laughs] Alright, the first question Microsoft Word or an old-fashioned typewriter? Peter: That was easy. I thought I’d throw you a softball. Peter: Okay, and what is section 704? Ashley: Its partnership and uh… basically partnerships. Peter: Thank you. You know what, I should really know that but I’ve been away from it so long that I’m just going to move into the third question. Peter: Disney channel or the Cartoon Network? Peter: What is your favorite show that your kids like to watch? Ashley: That’s a good question. We like Bubble Guppies. It’s mermaid kids that are put in different situations, but it’s a school under the sea. It’s pretty cool. Peter: Cool. One day my son was watching Blue’s Clues and he became addicted to Blue’s Clues – it’s all about Blue’s Clues. This fourth question is really easy for you. I should maybe have had this as a second. Partnerships or C corps? Peter: Yeah. What’s your favorite movie? Ashley: Oh goodness. Probably a kid’s movie, because that’s what we watch. Ashley: Probably of the Disney variety – but we have been stuck right now on Into The Woods, which is a musical with some old fairy tales so it’s pretty cool. Peter: I’ll have to look that one up. I have not seen that one yet. What’s your favorite song on your playlist? Ashley: Oh gosh. It’s a country song by Randy Houser, called “Like a Cowboy,” and it’s probably because I just saw him in concert about a month ago. I went to the Buckeye Country Superfest, and so that’s on my playlist on repeat right now. Peter: Oh, cool. I didn’t know you were a country girl. Ashley: I am. You know, if given a chance to see Luke Bryan live, I couldn’t pass that up. Peter: Not in a heartbeat. What’s your favorite city to visit on vacation? Ashley: Oh goodness. You know, I do like the metropolitan cities – I think they’re super cool – so I like to go to Chicago. I went there a lot for work, but it’s really nice to go there for weekend trips and what not just to kind of sightsee and explore. Peter: Yeah, Chicago’s one of my favorite cities. I’ve been there twice this year, but I go up to spend time at the Second City workshops and in the training department, but I do love Chicago a whole lot. A lot of great food. Do you prefer PC or mac? Peter: They do but also it kind of depends on the profession, because obviously a lot of Corporate America uses PCs because of windows, and those that are more on the creative side tend to use the PC. Even though now you can have Windows on your Mac, which to me is wrong but that’s just a personal thing. Peter: Gilligan’s Island or the Big Bang Theory? Peter: Okay, number 10. Last one. How did you find yourself becoming a CPA? Ashley: I took Pete Margaritis course at Ohio Dominican University. Peter: [laughs] No, no, no, no. 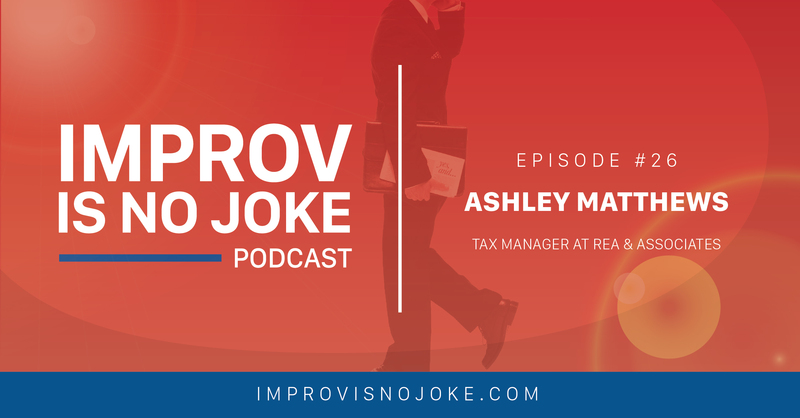 Ashley: His improv and humor made CPAs look wonderful. Peter: Okay, now you can tell us all the truth. Thank you for that. Ashley: [laughs] I honestly didn’t decide until I took my intro accounting courses and really just kind of liked the problem solving aspect of it. I think accounting and CPAs get a bad rap in terms of, oh I don’t want to do math the rest of my life. Well, it’s not math. It’s a lot of problem solving and finding solutions and I really like that aspect of it. Peter: And so, when you started at ODU, did you have an idea that accounting might be a major or was it those early classes that convinced you to try it as a major? Ashley: I thought it may be a good major but I didn’t really pile up my schedule with accounting courses with the intent that it would be my major, I guess is the way to put it. So I was on the fence until I took those courses. Peter: So it was either going to be accounting or theology? Ashley: Actually accounting or I was going to be an English teacher. Peter: That is very different, but that works really well in what you do because you do a lot of writing in your job. Peter: To be an effective writer in what you do goes a long, long way. Ashley: I agree with that. Technical memos are a piece of cake to me. Peter: Where they they stress a lot of others completely out. Peter: Well Ashley, I can’t thank you enough. I so enjoyed this conversation, and like I said I’m so proud of you and your career and where you are. I want to be there the day when you have the party when you become partner, because I know that’s not too far down the line. You’ll make a great partner with Rey, or wherever you go. I know Rey & Associates fairly well, and let’s just say they’re very lucky to have you. Ashley: Thank you, Peter, I appreciate those words very much.